I had the good fortune of chatting with the lovely Mikaella about her time in SUOC, during which she dutifully served as our Secretary, helped run countless events, and showed some folks the beauty of the mountains. Can I get some quick stats from you? Like your name, pronouns, class year, major, anything else you’d like to introduce yourself? Mikaella: she/her, I’m a senior at SU and I study Psych and Neuroscience. I’m graduating in May, sadly. But I’ll be here for another year. Oh, that’s cool — I’m excited to hear that. Exactly. How and when did you originally get involved in SUOC? Mikaella: I went to a few meetings in freshman year and was really overwhelmed. I ended up not going back. My Sophomore year I was like, “Ok I’m gonna join this time,” and I did. I just went for it. Then I went on a few rock climbing trips and that’s where I met a ton of people. And then I stayed. 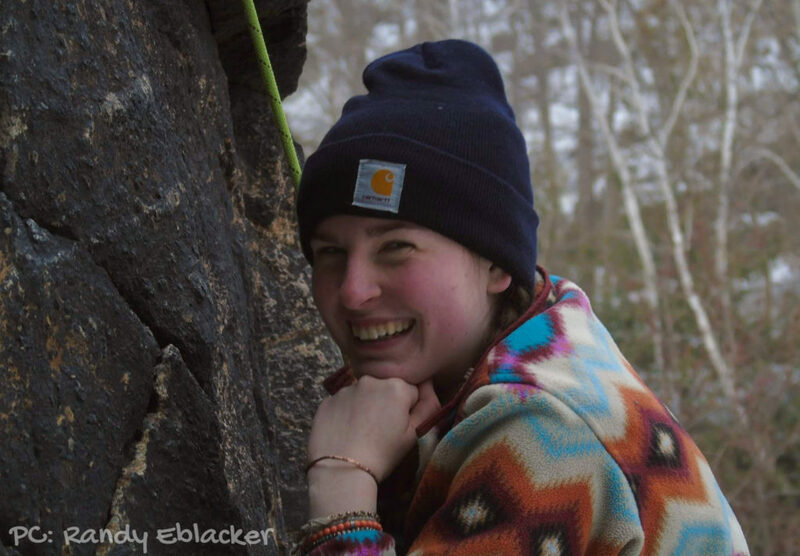 So was rock climbing the first trip that you went on? 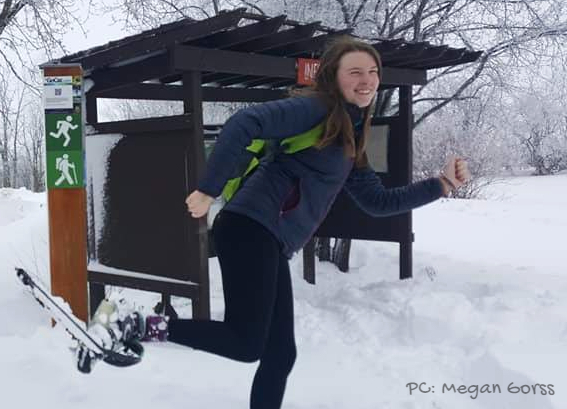 Mikaella: I went on a backpacking trip first and I went on a few paddling trips the first year. That kind of introduced me to SUOC and then I went on some rock climbing trips my sophomore year. 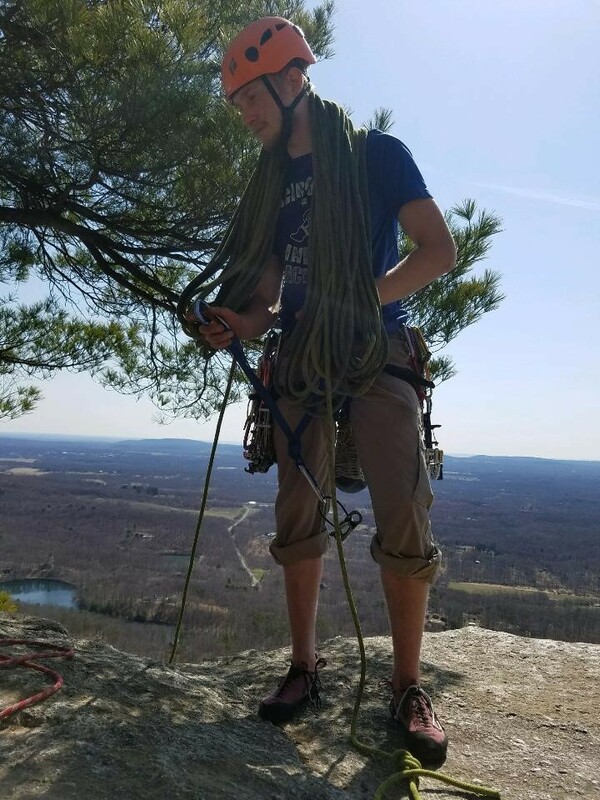 It took me a year and a half to build up the courage to go on a rock climbing trip, and I loved it, I wish I’d gone sooner. What has been your favorite or most memorable memory from your time in SUOC? Mikaella: I think I’m just gonna go with West Virginia because I feel like you meet so many people there, you know? And I feel like I’ve made a lot of friendships there, specifically. And you went to West Virginia twice, right? Which one was your favorite? Why? Mikaella: This one. I think it was my favorite because…I don’t know. First of all, the weather was better and I really liked that. I knew more people going into it this time and I feel like it was a really good group of people that I was surrounded by especially. I definitely made a lot of friends this year. What were your least favorite and most favorite parts of being Secretary? Mikaella: I don’t know, I guess my least favorite part…you know, sometimes you’re just tired and you don’t wanna go to the meeting. Sometimes it was nice even though I didn’t wanna go to the meeting initially, it was nice to have to go to the meeting. Once I was there it was fine. It was just leaving my house in the winter that was hard. I think my favorite part was getting to be more involved and getting to feel like I was doing something and helping out. Overall I loved the experience. So switching from fun stuff to maybe not fun stuff, have you ever struggled with anything in the club? Have you learned anything while you were in SUOC? Like about yourself, about recreation, about the outdoors, anything. Mikaella: I think it’s definitely deepened my love for being outside. I grew up, you know, doing a lot of outdoor stuff but I never really had friends who did it, too. It’s been really great to find people who really like doing the same things as me. Now, if I want to go do something outside, I have a ton of people that I can ask to go do that fun activity with me. Do you have any advice for people that are new to the club or are unsure about joining? Mikaella: I would say just go for it. It is really intimidating, no matter what anyone says, it is. Everyone in SUOC is so nice though, and everyone is very welcoming and wants to meet new people so you should just- you should just join. Also, trying new activities is really intimidating but, you know, beginner trips ARE beginner trips. You can go on them without ever having done that before. I would say that everyone is really encouraging with stepping out of your comfort zone. Even when I wasn’t good at it…for example, caving. Just terrible. Terrible. Just did not have fun. And they were all so nice — specifically Tim — so nice about it. Thank you, Mikaella, for an excellent interview. Congrats on graduating! Best of luck with your research, we look forward to seeing you around next semester. I sat down with SUOC’s newly elected President, Tim Bova, to discuss leadership, growth, and exploding rocks. Both of us laughed plenty, but only one of us cackled. Can I get some quick stats from you, like your name, your pronouns, your class, your major, anything that you’d like to include in your introduction. Tim Bova: Sure. Tim Bova. He/him. Junior. Conservation Bio. ESF student. 20 years old. You were just elected as president, correct? Bova: That is correct. Oh jeez, that happened. Bova: Pretty good. I mean, I like to joke just because it’s funny. How did you originally get involved in SUOC? When I originally came to ESF, my orientation leader recommended that I join Bob Marshall Club instead of SUOC. I never went to a Bob Marshall Club meeting because I showed up at a SUOC meeting and thought, “This suits me so much better.” Then I stopped doing Woodsmen because I didn’t have time to do that and SUOC and obviously SUOC won. I’ve been Assistant Eroom Chair for 2 years, been really actively involved in club things, doing whatever I could to help, going on tons of trips…I always wanted to do something for the club, and it turns out being President is the method for doing something significant, definitely. And it also gives me Eroom access, which is really nice. Yeah, I don’t get Eroom access now and I’m definitely a little upset about it. Bova: Yeah, I’ve had Eroom access since the beginning of Sophomore year. I am NOT looking forward to this time next year when I lose it. 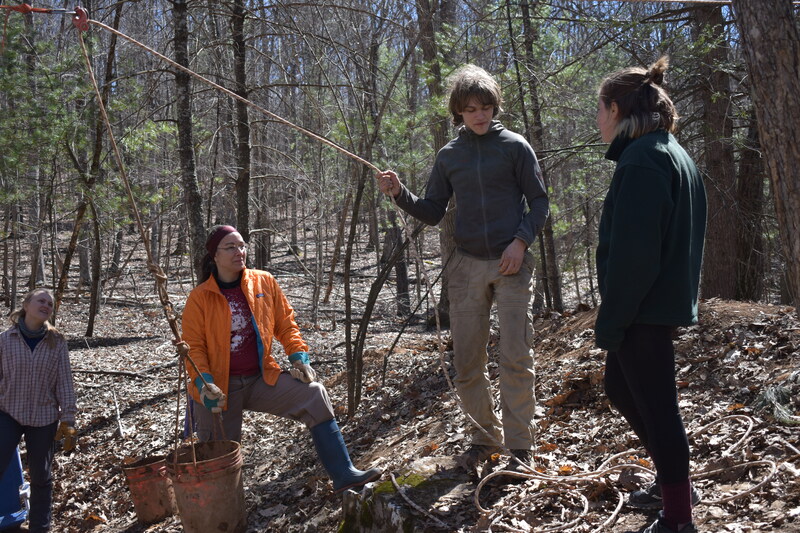 Bova: I don’t know, I don’t…It’s hard to pick out the specific memory because there’s just…all of my best experiences in college — with the exception of a few herping trips — have been with SUOC. It’s hard to pick just one? Bova: It’s hard to pick just one. I have a running list of maybe 5 or 6 “favorite trips” but it’s more like everytime I go on a trip and I’m comfortable calling it my favorite SUOC trip, it goes on that list. What was your favorite trip you went on over last Spring Break? Bova: That would be digging with the Butler Cave Conservation Society. That was the last day of Spring Break, I took a couple people out. That particular day was the big surface pit digging day for the Butler Cave Conservation Society, the BCCS. We went up to the house of an old caver, went up to his property which has like 5 or 6 different caves on it. It’s adjacent to a bunch of other properties that have caves on them. So one group ended up working on the Hot Brazilian Yogurt Entrance to some cave. I don’t know why it’s called that or what cave it goes into, but…and then two of our people ended up going to some other dig. I don’t know which one it was. There were like 5 or 6 active digs that day. Bova: A dig is when you think there’s a cave underground but there’s ground between you and the cave, so you remove the ground between you and the cave. This day, we got about 5 feet of forward progress which doesn’t sound like a lot for a full day of work, but it was about 5 feet through solid rock. We did a lot of smashing rocks which was pretty fun. How do you break through the rock…? Bova: [redacted], which was really cool. Bova: So, um, budget request: [redacted] and drinking straws. Bova: I think we could just buy the straws. I-I’ll just buy the straws, it’s fine. Have you ever struggled with anything in the club? Like is there anything that you wish you had handled differently in hindsight, or that was just really hard to deal with when it was happening? We can also skip this if you don’t wanna talk about it. Bova: No it’s more of just…all of it? Let’s see. To put a positive spin on this, all of our freshmen this year are so much better setup than I was freshman year. I was scared of everyone in SUOC when I joined. I was very active in caving — like I didn’t go on a non-caving trip until Spring Break — so I really only hung out with the caving section. I didn’t go to any parties. I had friends, but I didn’t have anything close to the relationships I would end up with later in SUOC. So…I’m really happy that all of the freshmen are so much less awkward and obnoxious than I was freshman year, because they’re so much better set up. I’m really excited to see how they develop. So that’s gonna be my positive take. Freshman year Tim was not as outgoing and I’m glad not many people remember him. So, wait. When you say you weren’t as outgoing, do you just mean that you specialized in caving and didn’t go to social things? Bova: No, Freshman Tim was obnoxious for a lot of other reasons. I can attribute a lot of my personal growth to the club. I’m sure most of our members can. Just being involved in SUOC at such a formative time has an effect on people. I like to think it’s a positive effect. Have you learned anything while you were in SUOC? About yourself, about recreation, the outdoors, I mean anything at all. Bova: Yeah, I’ve gotten a lot better at my soft skills. What do you mean by soft skills? Bova: Working with people. I’m not always great with working with people, but I’ve gotten better at leading trips, better at being patient with people, more comfortable with leadership skills. I was very much of the stereotypical Eagle Scout with lots of backpacking experience. And so, I felt kind of comfortable with leadership, but then I got scared of everyone in SUOC. I kind of had to get back to being comfortable. You hadn’t ever done a non-show caving before you joined SUOC, correct? 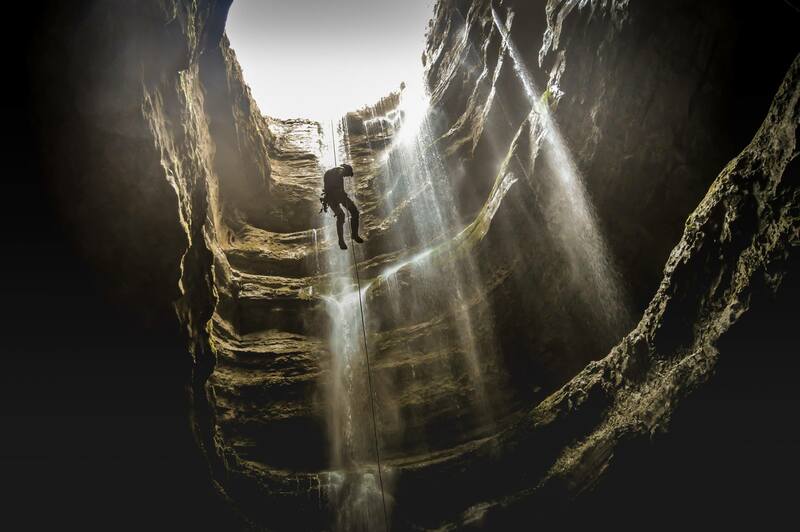 Bova: I’d been on a guided wild caving trip in Mammoth Cave. We had headlamps and protective gear on, so it was wild caving and it was a lot of fun, but yeah that was it. I’d done rock climbing, but it was with a guide service. I remember going back there a few weeks later to go hiking and I just free soloed all of it because it was so easy. I didn’t even consider it rock climbing, it was just scrambling and they put a rope on us. But, yeah. I’ve learned a lot about backpacking, I’ve learned a lot about the cold. I’ve gotten into a couple new sports I probably never would have even heard of if I hadn’t been in SUOC. What activities are you a leader in? Bova: I’m a leader in backpacking, horizontal caving, vertical caving, winter backpacking, and mountain biking. And I’m working on three others. Which ones are you working on? 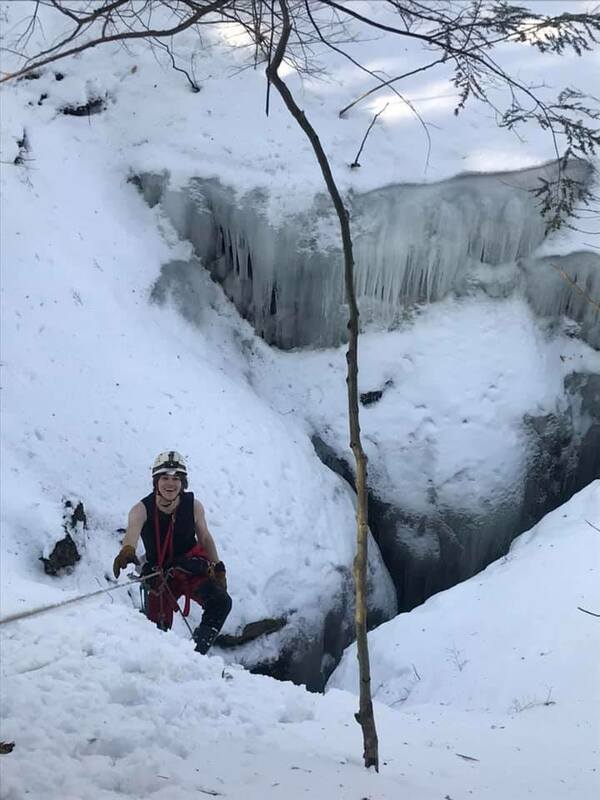 Bova: Flatwater, top-rope rock climbing, and ice climbing. Yeah, that’s not surprising, you seem super into ice climbing. Bova: I am EXTREMELY into ice climbing. I’m actively in the process of buying my own ice climbing equipment. There’s so much ice in China. I know that you worked in China last summer and you’ll be working in China this summer, do you expect that you’ll live in China for longer than that? Bova: Yeah. My boss basically offered me a Master’s position at the end of last summer. I’d hopefully spend two, maybe three years living full-time or part-time in China, who knows yet. But if I have winters when I can’t actually do anything…I can either sit at home writing things during the winter, or I can just go off to Western China, spend a few weeks out there every winter, climb some ice, do some things…That would be badass. My last question is, do you have any advice for people that are new to the club or who are on the fence about joining the club? Bova: At the risk of being glib, just kinda jump into it. 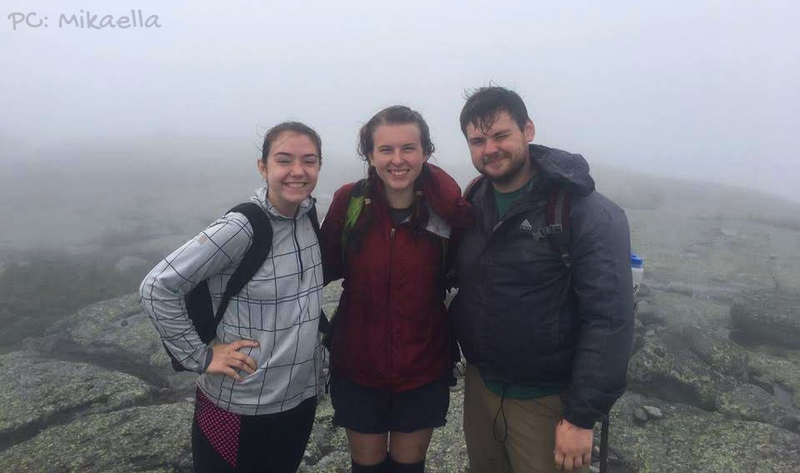 If you are interested in the outdoors and you don’t immediately despise SUOCers, just go on trips, go to Eroom hours, go to aftermeetings, go to meetings, go to premeetings. Just go to everything. We want you to be there. You should join SUOC. You should just do all the things. Spend all your money on gear and gas, work hard all week to get your schoolwork done, and spend your weekends doing SUOC things. Just continue to do that every week, all year. Builds character. If you’d like to meet Tim and learn his secret recipe for exploding rocks, join us at our next meeting! He’ll be the guy running the show at the front of the room. Entered: 1:00 am 8/11, Exited: a leisurely 1:00 pm 8/12. We pursued two leads that Scott and Stevan had bolted and rigged previously, both off the Pulpit Room. There is an ongoing and spirited debate about whether the squeezy crawl from Titanic to Pulpit is actually an easier route than climbing the spoogey Titanic slope-rope, ascending the bolt climb rope at ZW8 and traversing over to the Pulpit Room from above. The first lead, ZWR, was off ZWF34 (February 2018 work weekend survey) over a ~26’ pit with a nice rimstone pool at the bottom. We tied into an additional set station on the far side of the pit but could not read the station number. The approach to the tight keyhole lead involved a heroically rigged traverse along the edge of the pit and a 17’ ascent. The pool was situated as to make excellent plunking sounds as mud and rock tumbled down on the climb. Surveyed passage extended 131’ back (16 stations) along a sinuous, 2’ wide passage with a floor channel. There were several places where a switchback in the passage coincided with a breakdown block or some other projection that could only be overcome with wild contortions and multilingual cursing. Station ZWR12 marked a narrowing of the fissure to about 1’ wide. We shuffled each survey team member up to the constriction (climbing over one another to reorder ourselves). To the dismay of all parties, I was able to find a way to climb the fissure about 7’ (with much shoulder-standing and words of encouragement) up into a higher, marginally wider section of passage. Irina followed, Nathan could not. This upper level was well-decorated with soda straws and flowstone, and the terminal shot of ZWR16 marks a too-tight formation choke with moderate airflow. Irina de-rigged the ZWR drop and traverse on the way back to ZWF34. From there, we dropped the Grand Finale pit and ascended a second, shorter rope into the second lead of the day, about 30’ up the wall of Grand Finale. This was an extremely steep, sandy, hands-and-knees tunnel that ran 20’ up to a giant boulder, embedded in mud. The boulder plugged the entire passage except for a scant 3-4” gap above, and the space beyond it is large, dark and echoey. Irina and Nathan halfheartedly swung a hammer at it for awhile, and I hopped back into the Pulpit room and then back up to the ZWF34 pit to listen for any evidence of sound connection. There was no apparent connection: the void on the other side of the boulder appears to be separate from surveyed passage, likely a level between the Pulpit room below and the ZWF34 pit above. Some other means of persuasion will be necessary to get the boulder out of the way for the sweet booty beyond. We left that 20’ tunnel unsurveyed and the rope rigged, and ascended Grand Finale for the second time that day (what a stellar pit! ), reconvened with the Scott and Stevan team at the top of the January 2018 bolt climb (ZW8) to redistribute bolts, ropes and etriers. Some were left above the ZW8 rope, the rest returned to camp. Leads remaining: The boulder choke in a tunnel halfway up the Grand Finale. Other needs: at least two new water jugs as one in the Pinnacle Room and one in the Columbia Canyon water sources are broken enough to be ineffective. There is a moment of profound stillness halfway up the Puppet Buster rope. We are all battered and sore from the night and day of caving that came before. Nathan is still halfway up the upper rope by the time I make it to the rebelay. I clip into the midway bolt and wait as he climbs, heavy breathing and a periodic clink of vertical gear the only sound of his progress. My roped perch is unusually comfortable. I give weight to my chest strap and recline in the [totally subjective] security generated by visual contact with the bolt supporting me. The moment is mundane: there is nothing to do but wait in the stillness, observing the ascender inches from my face. The moment is extravagant: suspended on a wall, fifty feet in either direction from a place to stand, hundreds of feet below the surface of the earth. I contemplate the ceiling fifty, sixty feet above with Nathan’s figure suspended slightly in the foreground. A steady, regular chain of sparkly beads fall toward my light, just beyond my craned head. The drips pass beyond me, down through the darkness. I extend my arm and interrupt their passage with my palm. The ceiling is smooth and pleasantly scooped, a simplification of the jagged and rock-strewn floor far below. Below me is a breakdown block the size of a camper with no apparent origin on the wall or ceiling. I see the low glow of Irina’s light from the bottom of the lower rope, beyond the suspended breakdown blocks and fifty feet below. She begins to sing a wordless, vaguely classical tune. The resonance in the giant, otherwise silent and still passage compliments the piece. My only purpose is to listen to one friend struggle and the other sing. Usually it is easy to forget that 99.9% of MDC’s existence is in absolute silence and stillness. Right now, this is easier to conceptualize. The moment is pedestrian. The moment is exceptional. This respite has in it the endless feeling of a geologic time scale, but lacks the associated loneliness. Irina’s song, the only distinct word of which was “joy”, has morphed to “Baby One More Time”. I join in as Nathan grunts and growls his way into the Puppet Buster. The moment is over. Our egress continues. It started off with a bang. or, like, a little whistle. maybe more of a slow constant scream? planned an amazing trip, split equally between type I and type II fun, service-filled, friend-full, lovely. us—emshann, Claire, Vera, Elliott with two t’s and two l’s and two r’s, and me—had such a grand time! frosted-only cake, with emshann’s small pink camo lighter acting as a candle. oats, cereal, granola bars, apples, coffee, hot chocolate! pb cookies! what a treat! hoes and began our hike in! packed &amp; shared, celebrating with spoonfuls at every stop along the way. delicious veggie burritos and quickly fell into tired, full boi comatoses. fire, and by the time someone dropped the fourth, my eyelids had drooped closed, and I called it a night. armpit of her puffy and saving the entire endeavor. bought! Elliott put ice cream in his coffee! people emptied their bladders! When and where are regular meetings this semester? No experience needed – just come say hi, and sign up for a trip! Do you have some sort of meeting for people who are generally interested? Yup! Our General Interest meeting will be at 7:30 PM on Tuesday, September 11th in Grant Auditorium. This meeting – which is significantly larger than most of our regular meetings – will go over a lot of the basics of who we are and what we do, which will also be covered at the first few regular meetings of the semester. If you’re a little overwhelmed by the number of people, don’t worry – things tend to thin out once the semester gets going. Can I come talk about the club at some fair-type events? Come say hi, and sign up to get reminders about the general interest meeting! What do y’all do as a club? So much! 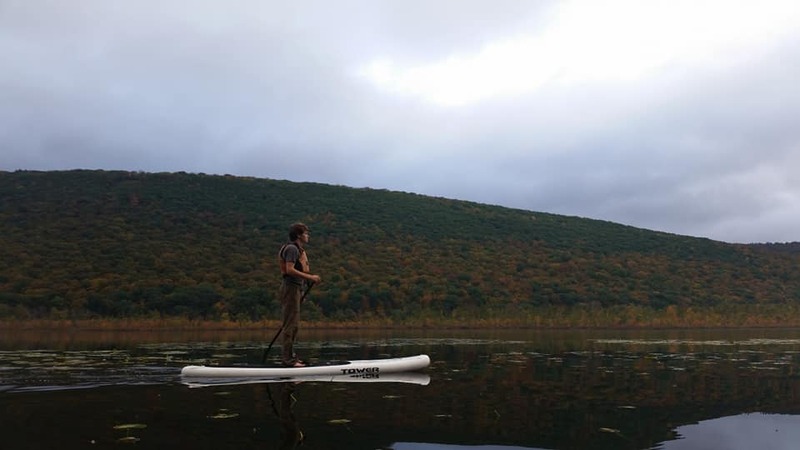 We do almost every outdoors sport you can imagine (the full list is under that “About” tab up above), as well as a bunch of non-sporting events throughout the year! There’s some more information on our About page, all throughout this website, and in our Facebook Group. We’re getting real excited to see you all again! Have a great end of your summer, and see you in September! I unbuckled my seatbelt and slid into the back. We turned around to grab Conor’s helmet sitting in our living room. We got to New Paltz – a town full of pubs and New York City dwellers escaped for the weekend – around 8:00. We found a little parking lot to sleep in, camping in the back of Conor’s luxury Toyota Prius. We ended up getting around ten hours of sleep that night, the most we’ve had all semester! We got up at 7AM, ate some breakfast, and headed to the crag. The Gunks are famous for their world-class multipitch traditional climbing, with very tough grades. Many climbers from elsewhere in the country are humbled by a Gunks 5.9. Many of the routes were closed because of peregrine falcon nesting, so it was quite crowded. We saw some other parties do some WILD things like top-roping with just a rope around a tree and making just terrible anchors. We climbed a route called Madame Grunnenbaum’s Wulst, or Madame G’s (5.6). This climb is usually completed in three pitches, being 210 feet, but we linked the second and third for a 170’ rope-drag-filled extravaganza! It was hard getting to the top because there was so much friction in the system (gotta bring up more draws next time!). I ended up taking a 20’ whipper on the first pitch of Something Interesting (5.7+), and to my dismay I had to leave my trusty green Alien Cam that caught my fall. I was too tired and spooked afterwards to lead the next pitch, so we lowered back to the ground. The view from the walls is absolutely beautiful, with the Catskill mountains framing a big open sky. Conor was going to lead a route called Three Pines (5.3), but the German party in front was taking a long time, so we left. After we made some vegan/gluten free garbage plates and called it a day! What great way to procrastinate Organic Chemistry. This post contributed by Ben VanderStouw. Do cool things? Want to share? Email us at mjmahone@syr.edu. Around 9 PM on Friday night, I was starting to get a little nervous. 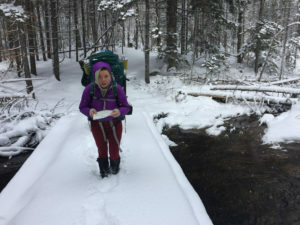 I was about two hours out of Syracuse and about three hours of walking into the Black River Wild Forest, a 130,000 acre forest preserve in the southwestern Adirondacks. We had been expecting a relatively easy hike in for the first day of our trip, but instead had found the trail untouched and hard to follow, with unmarked turns and snow-hidden creeks slowing us the entire way. It had gotten dark about an hour earlier, meaning that we were making even slower progress – and that we kept having to backtrack, mistaking small clearings and gaps in the woods for the narrow trail we were following. But soon enough we saw our lean-to – a squat little shelter left over from the 30s, when the CCC remade the Adirondacks with federal funds. I was thrilled. 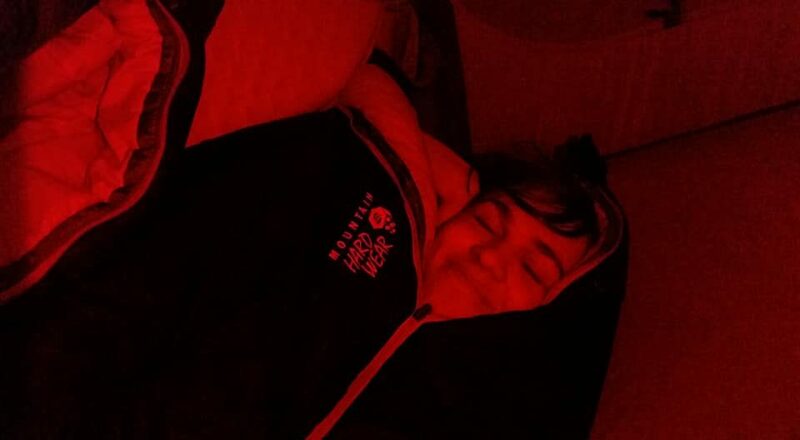 The only thing I cared about was getting into the shelter and going to sleep for the night. Emily Shannon, though, had some other things on her mind. “See that rock?” she asked, pointing to a small boulder off the side of the trail. So goes hiking with SUOC’s newest backpacking leader, who passed her ghost lead with flying colors this past Saturday. 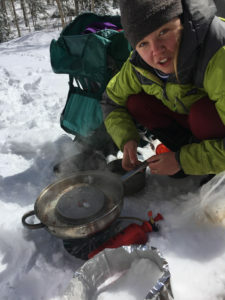 With a small trip to Chub Lake (and some outstanding backcountry pizza), Emily demonstrated her abilities as a backpacker and a leader, and did it in the traditional Em Shan style. With this trip, Em is now a leader in both three-season and winter backpacking, and is excited to take on her role as Backpacking Chair in the year to come. If you see Em Shan, make sure you say congrats – and make sure you sign up for her next trip!